To see really exciting new multimedia literacy try out Inanimate Alice. http://www.inanimatealice.com And its a free online resource! I enjoyed this thoughtful blog. The new short-attention-span technology raises plenty of questions. Great works of literature continue to disappear forever from required reading lists, replaced by new works in new formats delivered through new technologies. I wonder what we will sacrifice in the tradeoff between old and new. How will it affect our thinking? How will it alter our view of the world and of our identity? Oddly, I don't find myself mourning the change too much. It wouldn't do much good! I appreciate that we still have relics to study and admire. I'm in awe of the human drive to create and eagerly anticipate what will come next. As far as my own reading preferences, it would be impossible to replicate the perfection of Shakespeare. But I need only one Shakespeare for all time. My hope is that we give full rein to children's natural curiosity and provide broad exposure to various old and new media. Give them an abundance of choices and freedom to choose. Maybe future generations will read ancient words in holographic books? ;-) As Macbeth asked the witches, "If you can look into the seeds of time,/ And say which grain will grow and which will not,/ Speak then to me..." Macbeth was talking politics, but the same question could be asked about the future of art and literature--even reading and thinking. Thanks for this thoughtful summary of the educational landscape regarding the future of reading. As those of us who came of age when reading was regarded as essential linear, and time set off for rumination--this shift to the new media landscape, where reading is both more incidental and instrumental, can be difficult and painful. However, as you suggest, our task as engaged citizen is to find a way to use the methods and technologies available now to find a way to help today's students engage with complex texts-- and this may mean letting go of some of our assumptions about what reading looks like and even some of the abilities that it requires. . . I find it funny and satisfying to not only have enjoyed this article, but I also clicked on every link and read more about the articles and people referenced within it. Then I read the comments below it. If you'd asked me five years ago if I'd ever read off a computer screen, much less as much as I do, I would have said you're nuts. But now I do, regularly. And I comment on other people's writing, regularly. Which is not to say I have given up books. In fact, I read more than ever. But I grew up with them and can't imagine a life without a good hardcover or paperback. Reading and writing - speaking and listening. Reading and listening - writing and speaking. What to make of the advances to come in visual aural digital communication? Interesting times! Now, I'm off to read my book. It seems counterintuitive that the avid online readers mentioned in the NY Times article haven't developed their reading skills at least partially through their online activities --- as well as other skills such as evaluating sources and synthesizing different points of view. If people would rather play video games or watch YouTube clips (or play sports or watch sunsets), the question changes from "Online or Print?" to "Why read at all?" And that is a topic for a whole other set of posts. I think the only new wrinkles caused by the Internet are the generally minimal (or non-existent) standards of quality governing what may be "published" online. The excerpt from the piece of fanfiction quoted in the Times article --- "Just then I notice (Like finally) something sharp right in front of me. . . . I gladly took it just like that until something terrible happen” --- though hardly something most teachers would endorse as quality writing, gains a certain legitimacy simply by having been posted for all to see. The books we read --- however trashy their content --- have at least been edited for basic spelling, punctuation, and grammar. It seems equally counterintuitive to suppose that continued exposure to such poorly edited writing as can be found online does not make us more tolerant of it --- and more likely to repeat the same errors in our own writing. As someone who works with words for a living and who aspires to see my novels published and read -- in any format that fosters an audience -- I found the original article and the many subsequent blog posts quite interesting. It seems safe to say that there will always be change and there will always be those who pine for the past while others yearn for something new altogether. I believe that kids who read often now, whether online or while slouching on a sofa, will naturally find their minds and imaginations grow. The key is to keep progressing, which may mean reevaluating and reintroducing what worked worked for previous generations. As long as people are making progress, there is hope. It's heartening to read the comments and glean a common strand -- the recognition, acceptance, and openness to change. It's a fact that people today are reading differently than they did in the past and that access to and interaction with words increasingly involves various media. The excitement and the challenge of every new generation is to keep the engagement with words alive and to refine the tools to make that engagement pleasurable. But we can't just look back; we can and must look to the future. That's our collective responsibility in a world where more people are reading than ever before. I find it reflectively interesting to note which blogs I read, which comments I find engaging, which online discussion threads appear interesting. By living as a netizen, you learn how to write for the netizen, and subsequently how to teach to a netizen, even if it means using dayglo colors and swinging a digital 2x4 at the head. Concise is good. Combining humorous shock with a nugget of rare insight is better, but doing one without the other is doomed. Doing all three while inventing a new word now and again is guaranteed porsculisciency. 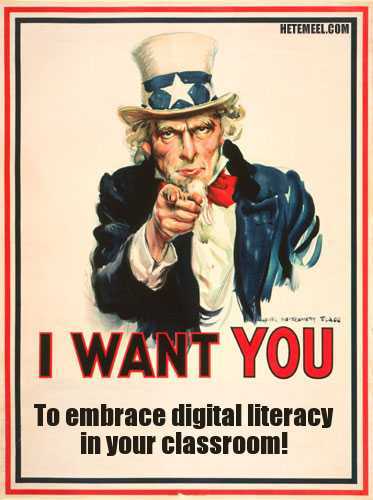 Digital literacy doesn't have to replace other types of literacy. There are plenty of kids who are still "bookworms" in the traditional sense of the word. Parents and educators can't just throw up their hands and blame a lack of interest in reading or writing on the influence of the internet. Kids do need to be led to the books—it's certainly more difficult to get to the library than to open a browser window. We need to model the behaviors we expect of our kids—and I know plenty of adults who continually switch among Facebook, e-mail, and text messaging (hopefully not while driving). We all have more options than ever before in terms of consuming and creating media, so naturally for most people there may be less hours spent pursuing any one media channel. Is that bad? Not in my book. I love having more options rather than fewer, more choices rather than less, and the option to interact or not. Makes life that much more enriched.